The specified file public://inline-images/https_%2F%2Fs3-ap-northeast-1.amazonaws.com%2Fpsh-ex-ftnikkei-3937bb4%2Fimages%2F0%2F3%2F0%2F5%2F13565030-2-eng-GB%2F20180405VolcanoTopImage.png could not be moved/copied because no file by that name exists. Please check that you supplied the correct filename. The specified file public://inline-images/https_%2F%2Fs3-ap-northeast-1.amazonaws.com%2Fpsh-ex-ftnikkei-3937bb4%2Fimages%2F_aliases%2Flarge_580%2F4%2F3%2F2%2F5%2F13565234-4-eng-GB%2F20180405EarthquakeMap.png could not be moved/copied because no file by that name exists. Please check that you supplied the correct filename. The specified file public://inline-images/https_%2F%2Fs3-ap-northeast-1.amazonaws.com%2Fpsh-ex-ftnikkei-3937bb4%2Fimages%2F_aliases%2Flarge_580%2F3%2F2%2F2%2F8%2F13558223-3-eng-GB%2F20180405Keyword2.png could not be moved/copied because no file by that name exists. Please check that you supplied the correct filename. The specified file public://inline-images/https_%2F%2Fs3-ap-northeast-1.amazonaws.com%2Fpsh-ex-ftnikkei-3937bb4%2Fimages%2F_aliases%2Flarge_580%2F9%2F3%2F2%2F7%2F13557239-2-eng-GB%2Fsinabung-schoolkids_20180405_0.jpg could not be moved/copied because no file by that name exists. Please check that you supplied the correct filename. The specified file public://inline-images/https_%2F%2Fs3-ap-northeast-1.amazonaws.com%2Fpsh-ex-ftnikkei-3937bb4%2Fimages%2F_aliases%2Flarge_580%2F8%2F6%2F7%2F5%2F13565768-4-eng-GB%2F20180405RingofFireMap.png could not be moved/copied because no file by that name exists. Please check that you supplied the correct filename. The specified file public://inline-images/https_%2F%2Fs3-ap-northeast-1.amazonaws.com%2Fpsh-ex-ftnikkei-3937bb4%2Fimages%2F_aliases%2Flarge_580%2F2%2F7%2F9%2F5%2F13565972-1-eng-GB%2Fkrakatoa-drawing_20180405.png could not be moved/copied because no file by that name exists. Please check that you supplied the correct filename. The specified file public://inline-images/https_%2F%2Fs3-ap-northeast-1.amazonaws.com%2Fpsh-ex-ftnikkei-3937bb4%2Fimages%2F_aliases%2Flarge_580%2F4%2F8%2F1%2F8%2F13558184-2-eng-GB%2F20180405Keyword1.png could not be moved/copied because no file by that name exists. Please check that you supplied the correct filename. The specified file public://inline-images/https_%2F%2Fs3-ap-northeast-1.amazonaws.com%2Fpsh-ex-ftnikkei-3937bb4%2Fimages%2F_aliases%2Flarge_580%2F2%2F6%2F2%2F8%2F13558262-2-eng-GB%2F20180405Keyword3.png could not be moved/copied because no file by that name exists. Please check that you supplied the correct filename. The specified file public://inline-images/https_%2F%2Fs3-ap-northeast-1.amazonaws.com%2Fpsh-ex-ftnikkei-3937bb4%2Fimages%2F_aliases%2Flarge_580%2F1%2F0%2F3%2F8%2F13558301-2-eng-GB%2F20180405Keyword4.png could not be moved/copied because no file by that name exists. Please check that you supplied the correct filename. The specified file public://inline-images/https_%2F%2Fs3-ap-northeast-1.amazonaws.com%2Fpsh-ex-ftnikkei-3937bb4%2Fimages%2F_aliases%2Flarge_580%2F5%2F0%2F0%2F7%2F13557005-3-eng-GB%2Ftents_20180405.jpg could not be moved/copied because no file by that name exists. Please check that you supplied the correct filename. The specified file public://inline-images/https_%2F%2Fs3-ap-northeast-1.amazonaws.com%2Fpsh-ex-ftnikkei-3937bb4%2Fimages%2F_aliases%2Flarge_580%2F1%2F5%2F3%2F5%2F13565351-2-eng-GB%2F20180405DisasterTimeline.png could not be moved/copied because no file by that name exists. Please check that you supplied the correct filename. Is The 'Ring Of Fire' Becoming More Active? When Bali's Mount Agung started rumbling last September, authorities on the Indonesian resort island -- mindful of the destruction the 3,000-meter volcano had caused in 1963 -- began warning residents to evacuate. Tremors of varying intensity continued until Nov. 21, when it finally began to erupt, forcing as many as 140,000 people to seek refuge. More than four months later, it still hasn't stopped. On Jan. 23, Mount Kusatsu-Shirane, about 150km northwest of Tokyo, astounded the Japan Meteorological Agency when it suddenly erupted 2km from one of 50 areas around the country kept under constant video surveillance. Falling debris killed a member of the Ground Self-Defense Force who was skiing nearby and injured five others. 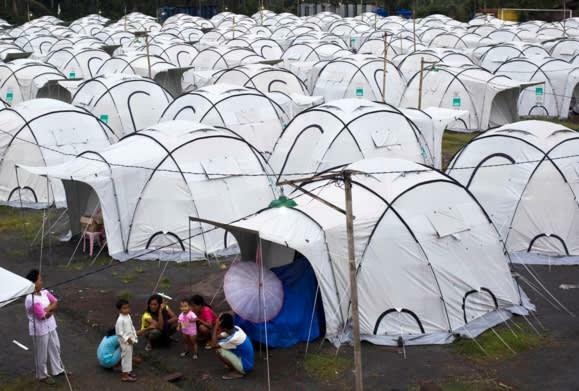 At much the same time, Mount Mayon in the Philippines began spewing ash and lava, displacing more than 56,000 people. Then, in mid-February, Mount Sinabung in Sumatra, Indonesia, blew spectacularly, sending billowing pillars of steam and superheated ash over 7km into the air. People fled, and schoolchildren ran home wailing. 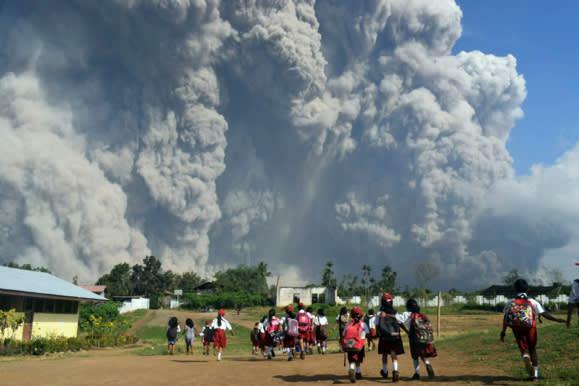 Sinabung's eruption was followed in late February by a magnitude-7.5 earthquake in Papua New Guinea, its worst in a century. Earlier in the month, a magnitude-6.4 quake rocked Taiwan's Hualien County, tilting buildings and killing 17. 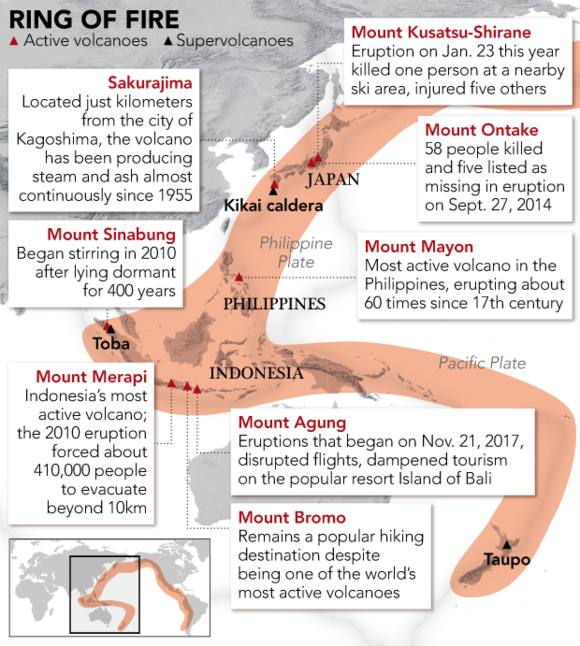 Such seismic restiveness in Japan, the Philippines and Indonesia is a fact of life along the "ring of fire," the horseshoe-shaped belt in the Pacific Ocean that is home to about three-quarters of the world's most active volcanoes. Yet after what some experts call a relatively subdued 20th century for seismic activity, the 21st has seen an uptick in "great" earthquakes. And the first 18 years of this century has seen about 25 significant volcano eruptions globally, compared with some 65 in the entire 20th century. Professor Yoshiyuki Tatsumi of the Kobe Ocean-Bottom Exploration Center at Kobe University says the recent volcanic activity in Asia is "just the ring of fire being as it has always been in history." 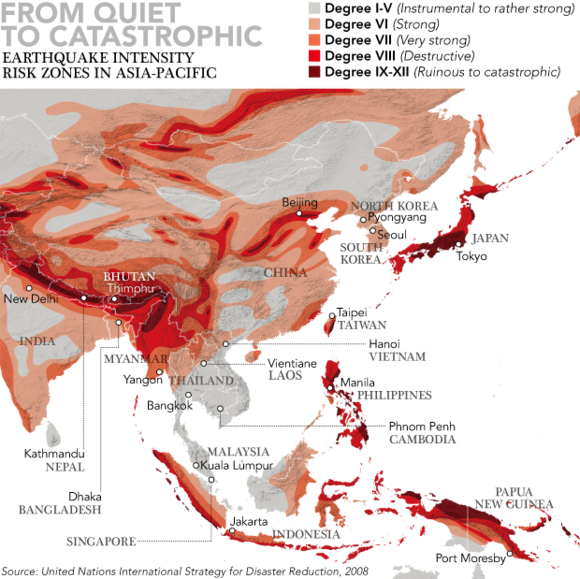 The key, he told the Nikkei Asian Review, is to ensure that governments and scientists are prepared for eruptions before the signs are visible. "We have to be aware that we are living in a region where volcanic activity is almost always there." The recent surprise eruption in Japan is a salutary reminder of the unpredictability of these events. "We are now retrospectively investigating whether our sensors were picking up slight signs," said professor Yasuo Ogawa from the Volcanic Fluid Research Center of the Tokyo Institute of Technology. "But the fact is that we were not able to predict it in advance this time." The challenge is great in Indonesia, home to 127 volcanoes -- more than half of which must be continuously monitored for activity. "The truth is that the chain of volcanoes in the Sunda Islands of Indonesia, from Sumatra through Java and Bali to Timor, constitutes the most dangerous of the world's tectonic interfaces," professor Anthony Reid wrote in October on New Mandala, an Australian National University website. Reid noted that Indonesia had a mild 20th century in seismic terms, and warned that things might be changing. "The 21st century has in its first decade already far exceeded the number of casualties from ... the whole 20th century" in Indonesia, he said. The massive death toll largely comes down to one event. Triggered by a magnitude-9.2 earthquake off northern Sumatra, the third-largest in history, the Indian Ocean tsunami of 2004 was the most deadly ever recorded. Affecting 14 countries surrounding the Indian Ocean, it killed almost 240,000 people, over 70% of them in Indonesia's Aceh Province. 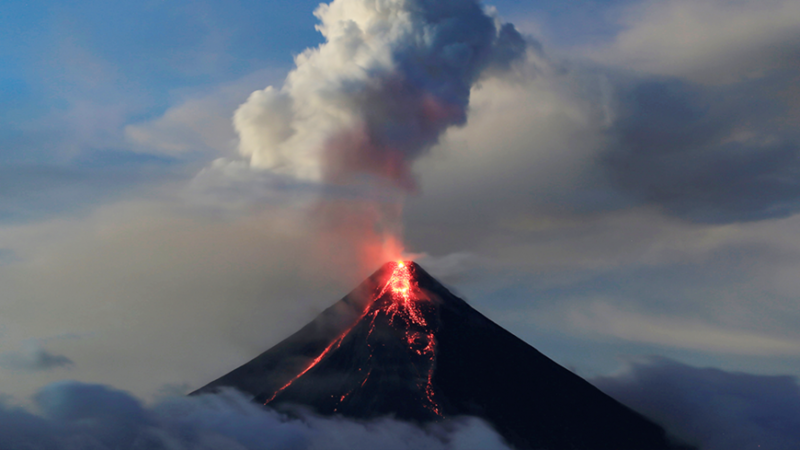 Of the 300 volcanoes in the Philippines, 24 are "active," or have recorded at least one eruption in the last 10,000 years, Renato Solidum, head of the Philippine Institute of Volcanology and Seismology (Phivolcs), told Nikkei. Phivolcs also monitors Mount Kanlaon in the central Philippines and Mount Bulusan, 70km away from Mount Mayon. Lower alert levels have been assigned to them, and neither is thought to pose an imminent threat. Mount Mayon, a stratovolcano with an iconic cone shape, is the most active volcano in the Philippines, having erupted some 60 times since the 17th century. Its recent belligerence triggered evacuations in 2009 and 2014. The latest alert level was downgraded in early March from 4 out of a possible 5 to 2, but a 6km exclusion zone remains in place. Volcanoes and earthquakes are seismic twins, born of the natural bumping and grinding of the world's tectonic plates, a timeless process unrelated to global warming and climate change. Mankind's mistreatment of the environment will not cause volcanoes to erupt, or the earth to move, but seismic events do have powerful impacts on the environment. Earthquakes collapse buildings, destroy infrastructure and ground aircraft. Those at sea can generate tsunamis when plate subductions displace vast amounts of seawater and send it racing to shore at the speed of a jumbo jet, slowing and rising as it arrives. Northern Japan's magnitude-9.0 earthquake and subsequent tsunami in March 2011 killed nearly 16,000 people. The Indonesian archipelago is located amid four major tectonic plates -- the Eurasian, Indo-Australian, Pacific and Philippine -- making it the world's most earthquake-prone region. A meeting point of two plates -- called a megathrust segment -- stretches between the Sunda Strait and the southern sea off Java, close to Jakarta. Because the segment has not experienced quakes in recent centuries, some worry that a powerful shift is on the way that could affect Jakarta. "We call it a seismic gap," Danny Hilman Natawidjaja, an earthquake geologist at the Indonesian Institute of Sciences, told Nikkei. "That means the segment has potential for a major earthquake, as a very high amount of energy may have been accumulating." Natawidjaja believes a magnitude-8.5 or larger earthquake to be quite possible, but there is no way of telling if this will happen. "It can be in the next several years or somewhere in the coming decades." Further eruptions and earthquakes are a natural certainty, but predicting them is much harder than measuring their scale and impact after the event. The relative mildness of the 20th century contrasts with the incredible ferocity of volcanic activity in the preceding century. The first time a volcano truly made news is well-known: at precisely 10:02 a.m. on Aug. 27, 1883, the "day the world exploded." 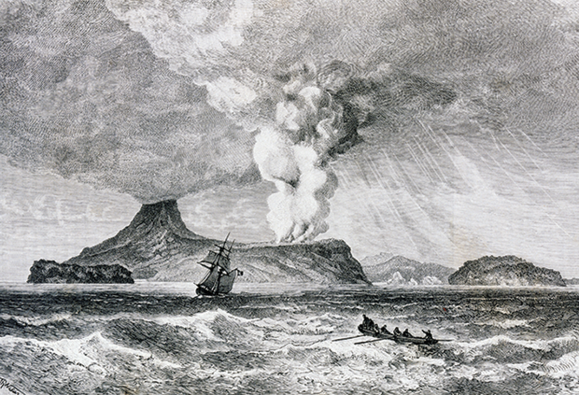 The eruption of Krakatoa in the Sunda Strait west of Java in what was then the Dutch East Indies, when Jakarta was called Batavia, was heard thousands of kilometers away in Australia. Through the advent of the submarine telegraph and newswire services, the disaster was also known about in real time in all the capitals of the modern world. In his book "Krakatoa," British author Simon Winchester describes this apocalyptic occurrence in what is today Indonesia as the day "the modern phenomenon known as the global village was born." Krakatoa was not only the world's first shared news event, it was also the world's last truly global environmental catastrophe wrought by Mother Nature. It affected climate and food production in all parts of the world as volcanic pollution of the upper atmosphere induced a worldwide wintering that lasted five years. The 1969 Hollywood film "Krakatoa: East of Java" wrongly placed the three collapsed volcanoes involved. Forming a natural memorial to these volcanoes today is Anak Krakatoa, or "child of Krakatoa," which rose from the sea in 1928, evidence of lingering activity. Krakatoa was catastrophic. 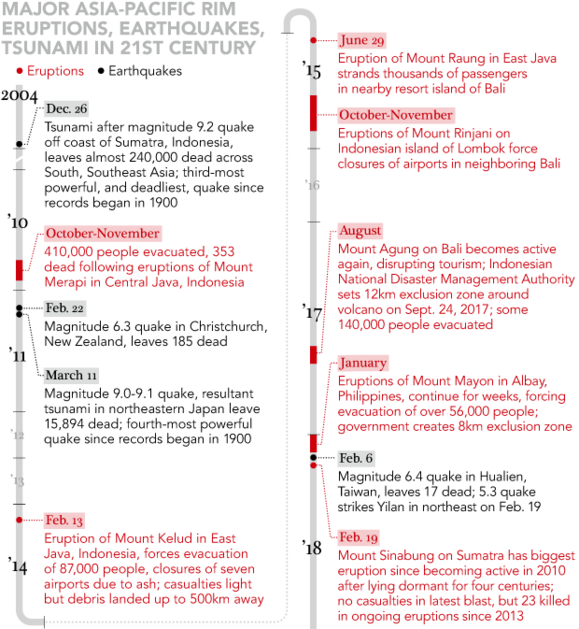 Many of the 35,000 killed at the time were victims of the tsunamis it generated. The population of the East Indies was then some 34 million, about 13% of today's estimated 266 million -- a clue to the possible impact of a future mega-event. Nobody alive today has any experience of an eruption of Krakatoa's magnitude. The great blasts of Mount St. Helens in the U.S. in 1980 and Mount Pinatubo in the Philippines in 1991, which killed over 800 people, were smaller by comparison. Since 1982, experts have measured the power of volcanoes using the logarithmic volcanic explosivity index (VEI), which ranges from 0 to 8. A VEI 1 volcano, such as those found on Hawaii's large southernmost island that are constantly venting lava flows, is benign compared with a VEI 6 like Krakatoa, which was 100,000 times more powerful. Pinatubo, the most serious eruption in the region in the past 50 years, also has a VEI 6 rating, but its eruption was considerably less potent than Krakatoa's. For all its infamy, Krakatoa was not the worst eruption in its century and region. A few elderly people alive in 1883 might actually have recalled the even deadlier 1815 eruption of Mount Tambora on Sumbawa Island, which killed over 90,000 people in its immediate aftermath. Tambora was a VEI 7, with 10 times the explosivity of Krakatoa. It emitted a toxic cloud of ash that cooled and darkened the world for years, triggering famine, pestilence and civil disorder. There were food riots in Switzerland and freak winters in China's Yunnan Province. The massive volcano, which sits in Indonesia's West Nusa Tenggara Province, and its repercussions were blamed for a cholera epidemic that killed even more people five years later in Java. The most powerful eruption in recorded history, its effect was incomparably pervasive. Even the extraordinary hues in the skies and sunsets painted by one of Britain's most celebrated artists, J.M.W. Turner, are attributed to it. The following year, 1816, was to be remembered in many lands as the year without summer. The extent of Tambora's damage is better recorded in North America, Europe and China than in Southeast Asia because of more systematic records. Although Tambora was the largest eruption in thousands of years, scientists have been able to determine from evidence such as residues in the polar ice caps that Mount Samalas also wrought recent global havoc in 1257, sending record volumes of sulfur dioxide and other noxious gases into the atmosphere. Samalas belongs to the Mount Rinjani volcanic complex on the Indonesian island of Lombok. Indonesia's volcanoes are monitored by the Center for Volcanology and Geological Hazard Mitigation, or PVMBG. It advises on timely evacuations that locals sometimes grow weary of observing. When Mount Agung erupted in 1963, it went on for a year and left 1,500 dead while President Sukarno suppressed the news for political reasons. Casualties this time have so far been kept to zero. Citing recorded conditions of large volcanoes like Mount Agung and Mount Semeru in East Java, Surono, a former PVMBG chief, believes the chances of a second Tambora to be very small, and that there would be plenty of opportunity for advance warning in such an event. "There is no volcano erupting without giving out early signs," Surono told Nikkei. "It's like rain starting with drizzle -- giving you a chance to open an umbrella." In Japan, professor Tatsumi has found a new reason to be concerned, however. In a paper in February, he reported the existence of gigantic lava dome in a Japanese supervolcano, the Kikai caldera -- a VEI 8 category potentially 10 times more powerful than Tambora. According to Tatsumi, pressure is building up inside the 32-cu.-km offshore lava dome that last erupted some 7,300 years ago. Tatsumi believes volcanologists actually have very little idea of what to expect from the world's largest volcanoes, and others have remarked on how speedily they may prime themselves. "I would imagine there will be some signs like tremors, but mankind has not determined the mechanism of supervolcano eruptions, how they occur," he said. "If it erupts, it can kill 90 million people in the worst-case scenario." He predicts 50cm ash layers in Osaka and 20cm in Tokyo if the Kikai dome blows its top. There are a dozen or so VEI 8 supervolcanoes around the world that erupt full bore incredibly infrequently. The grandfather of them all is Yosemite in the U.S. state of Wyoming, but closer to home lurks Lake Toba in northern Sumatra and Lake Taupo on New Zealand's North Island, both massive stretches of water. There is also the Aira caldera on the southern Japanese main island of Kyushu. Given the rarity of supervolcano eruptions, Tatsumi's prediction for Kikai is not comforting: a 1% chance over the next 100 years. When the Great Hanshin-Awaji Earthquake devastated Kobe in 1995, killing over 6,400 people, the predicted likelihood for such an event was 1% in 30 years. "So, 1% in 100 years is actually a code word for 'anytime soon,'" said Tatsumi. Others debate whether Yosemite, which could kill billions in a worst-case scenario, is due for a blast in 50,000 years -- or already overdue by 20,000 years. Still, it is clearly the much more frequent VEI 4-6 eruptions, with their proven capacity to disrupt normal life, that pose the greatest threat, particularly in a world that has become so dependent on aviation. When Mount Merapi in central Java, Indonesia's most active volcano, erupted in late 2010, it killed over 350 people and forced the evacuation of some 410,000 others. Merapi is rated a VEI 4, compared with Mount Agung's VEI 5 in 1963. The Philippines remains less preoccupied with volcanoes than the "Big One" -- the unoriginal term the media have coined to describe a possible major earthquake affecting Metro Manila. The West Valley Fault runs through the capital of over 13 million souls. According to a 2004 study conducted by Phivolcs, Metro Manila Development Authority and the Japan International Cooperation Agency, the West Valley Fault could generate a magnitude-7.2 earthquake. The fault manifests itself every four to six centuries, and last caused grief in the 1600s. "Perhaps it can move in our lifetime," said Solidum. "So better if we prepare." Philippine President Rodrigo Duterte brought the issue up in his state of the nation address last July. Two weeks earlier, four people had perished in a magnitude-6.5 temblor in the central Philippines. "We were told that it is no longer a question of 'if' but a matter of 'when'," said Duterte. "We need to act decisively and fast because the threat is huge, real, and imminent."